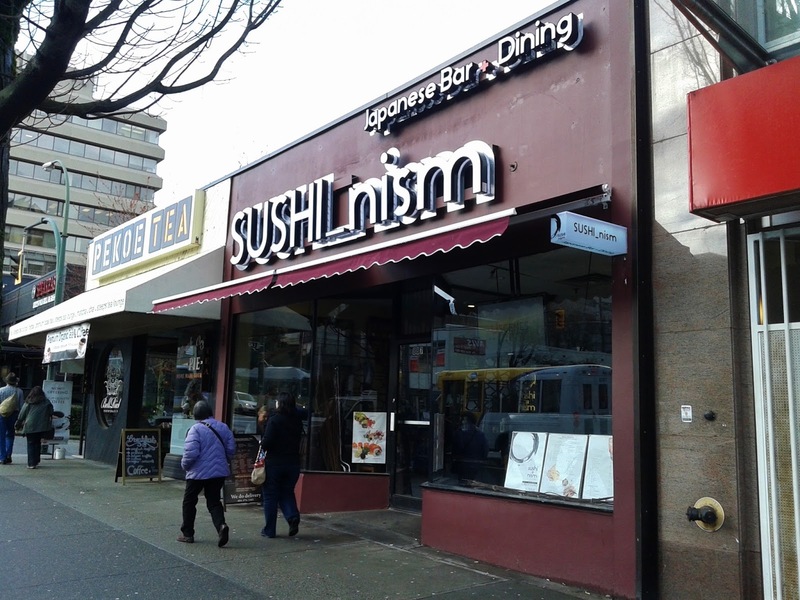 After finishing all my classes at SFU for the day, I went to study my favourite subject, sushi-nism, at a restaurant named Sushi-nism. Sushi-nism is Korean-operated and replaced Sake Cafe just a few weeks ago. I really wonder why Sake Cafe closed down. The last time I passed by Sake Cafe, there were so many customers that the restaurant could not seem to accommodate them all. It literally looked like Sushi Garden on steroids. Furthermore, the prices looked quite good, and I had wanted to try the restaurant myself. Sushi-nism, however, was virtually deserted when I went in. Sushi-nism is branded to seem like a semi-fancy Japanese restaurant, but the interior decor was neither elaborate nor fancy. Looking at the menu, I did see the type of combo where you choose three items plus miso soup for $9.95. This was a good deal, but where was the option to choose four items or five items for people like me? In the end, I decided to go with the Lunch Box D because it was more in line with what I felt like having. The Lunch Box D came with a Miso Soup, which had a good consistency and a pleasant miso flavour. It was slightly salty, but not overly so. 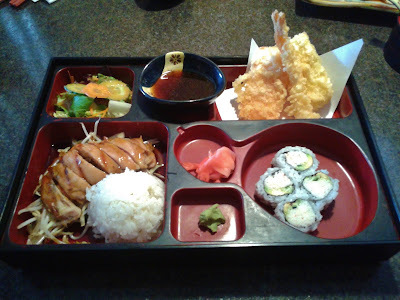 Here is the rest of the Lunch Box D. For $12.95, this was a decent amount of food. The Salad consisted mainly of lettuce cut into bite-sized pieces. 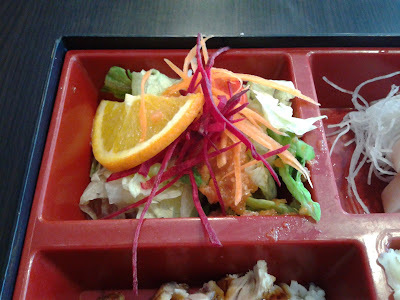 It was dressed with some orange-flavoured vinaigrette, but it somehow ended up watery and weak in flavour. Some parts of the Tuna Sashimi were soft, and overall, it tasted fresh with no fishiness. 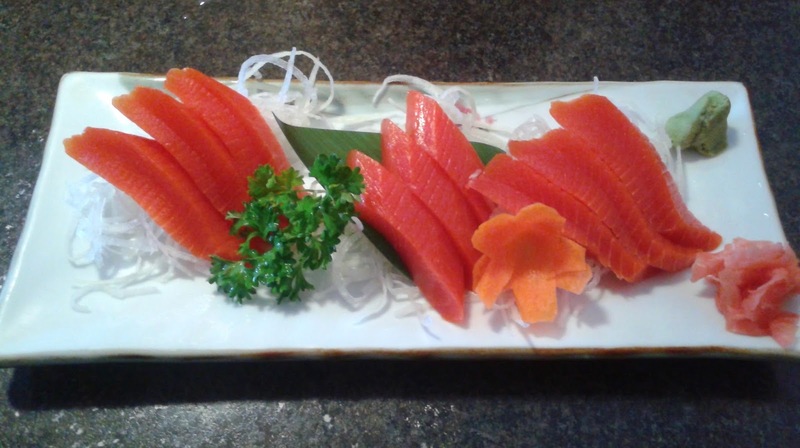 The Salmon Sashimi had a smooth sheen and a mild creamy flavour. It started to come apart at the white lines, but at least the knife skills were clean and the thickness of each piece was just right. Unfortunately, things went a little downhill with the Chicken Teriyaki Don. Only some parts of the chicken were tender, and the chicken didn't really have a smooth texture for me to enjoy. When I lifted the chicken, I found a small, mushy clump of rice in the middle. There was pretty much a swimming pool's worth of teriyaki sauce to the left, and that's pretty much where all of the flavour came from. 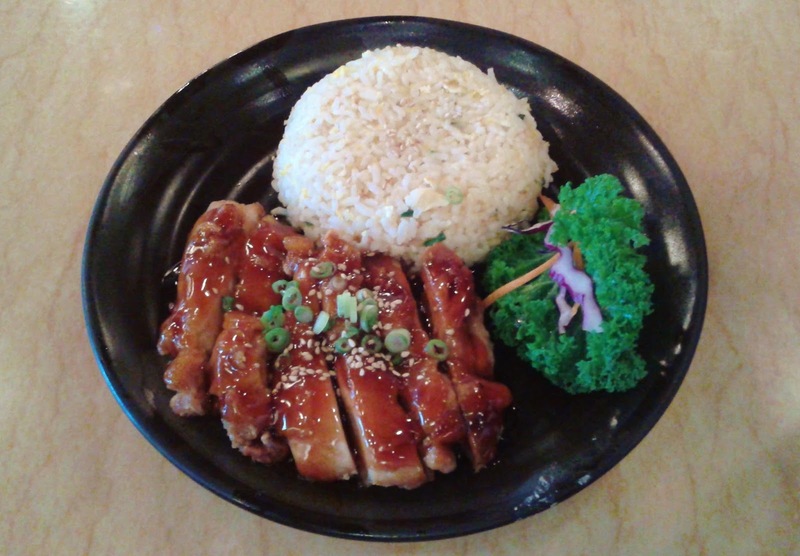 It reminded me of my childhood visits to Koya, when I would keep asking the chef to pour teriyaki sauce onto my chicken teriyaki until my parents started yelling at me for consuming so much salt. The tempura was also one of the more disappointing moments of my meal. The Sweet Potato Tempura was coated with way too much batter. It was sweet, but it was also very crunchy. 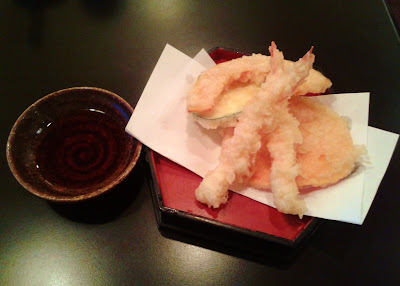 The Yam Tempura came with a disturbing extra clump of batter that was fried to a crisp. Out of curiosity, I tried to eat it, but it tasted like a thick potato chip nightmare (and I don't like potato chips to begin with). The Kabocha Tempura was sliced thin and not particularly rich in flavour. 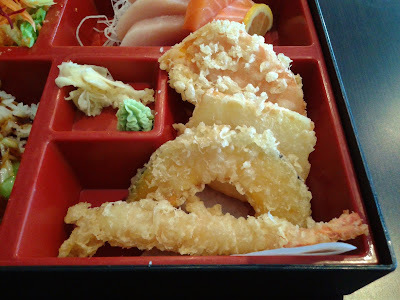 The Prawn Tempura was the most satisfactory of the bunch, and it had a nice savoury flavour, though the batter was again thick and tasted floury. For my special roll, I went for the Awesome Roll, hoping that it would actually be awesome. It consisted of crab meat, avocado, cucumber, salmon tempura, crunchy yam fries, spicy mayonnaise, and unagi sauce. It's too bad that it didn't live up to its name. The crab meat was coarse and strangely dry. The salmon tempura was also rather weak in flavour. However, there was a good amount of spicy mayonnaise, which combined with the unagi sauce to provide adequate flavour to the roll as a whole. The yam fries provided a nice crunch. They also had seared sushi on the menu, so I went for the Seared Toro Nigiri. I tried to ask the waitress (who in turn asked the sushi chef) about what other kinds of seared nigiri would be good, but both of them kept recommending the Seared Toro Nigiri, which I had already ordered. Finally, after about six or so tries, our problems with English communication were finally solved, and they suggested the Seared Saba Nigiri. The Seared Toro Nigiri came with soft toro, which was juicy on the bottom. The nigiri exhibited decent rice formation and a slight smoky flavour. 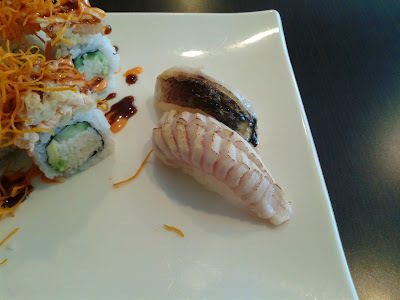 The Seared Saba Nigiri was the best item of the entire meal, and it had an enjoyable soft and flaky texture. Despite the English issues, the service was decent and adequate. Since there were very few people in the restaurant, the servers were folding coloured napkins in the corner, and they seemed to be having even more fun than I was while taking notes about the food. For the most part, I found the food to be slightly below average. However, the reasonable prices and convenient location may make the restaurant suitable for those who work in the offices nearby. 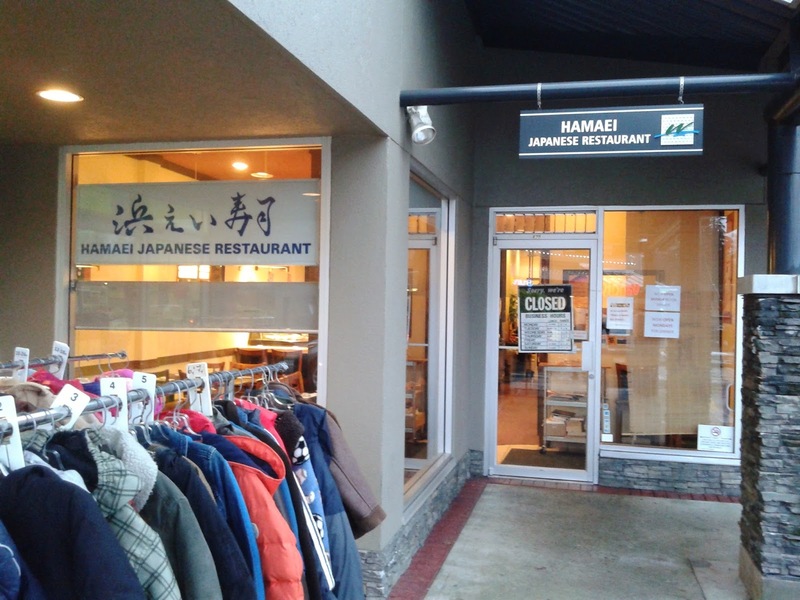 Hamaei Japanese Restaurant is authentic and has a reputation for well-prepared traditional Japanese food. However, it is located in the midst of the mountainous terrain of North Vancouver, and the infrequent buses there make the place a challenge to get to. North Vancouver's confusing road system, with linear, parabola-shaped and cubic-function-shaped roads, does not help either. My brain can only comprehend so much math. I had heard about Hamaei since last year, but I decided to hold off my visit until the weather was warmer and sunnier. Ironically, I ended up visiting Hamaei on one of the rainiest days of 2016, all due to a sudden craving for healthy traditional Japanese food. Evidently from the photo, I arrived at the restaurant a little too early, so I decided to walk around in the surrounding plaza just to get myself more soaked. 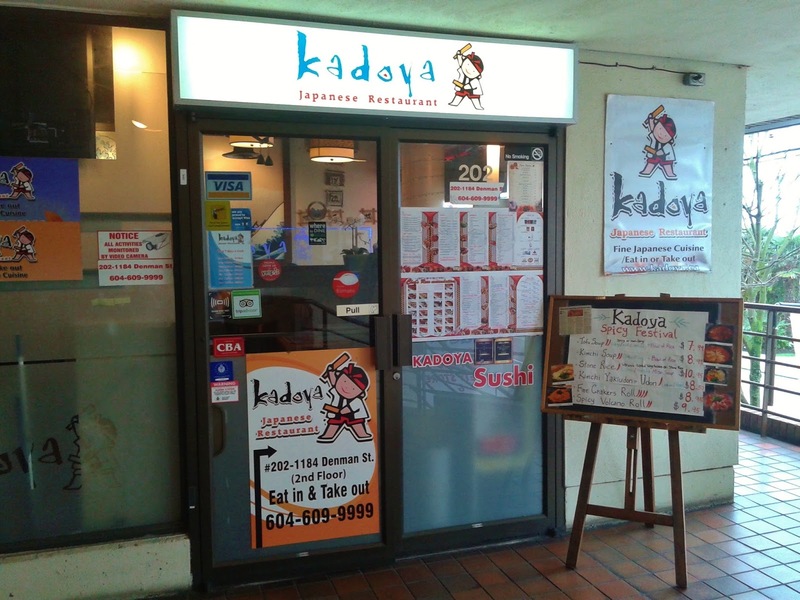 Once the waitress flipped around the "Closed" sign, I went in and noticed that the dining space was cozy and comfortable with a prominent traditional Japanese accent. While I was waiting for my food to arrive, one of the waitresses presented me with a complimentary Miniature Wakame Salad! It was well-seasoned and easy to digest. 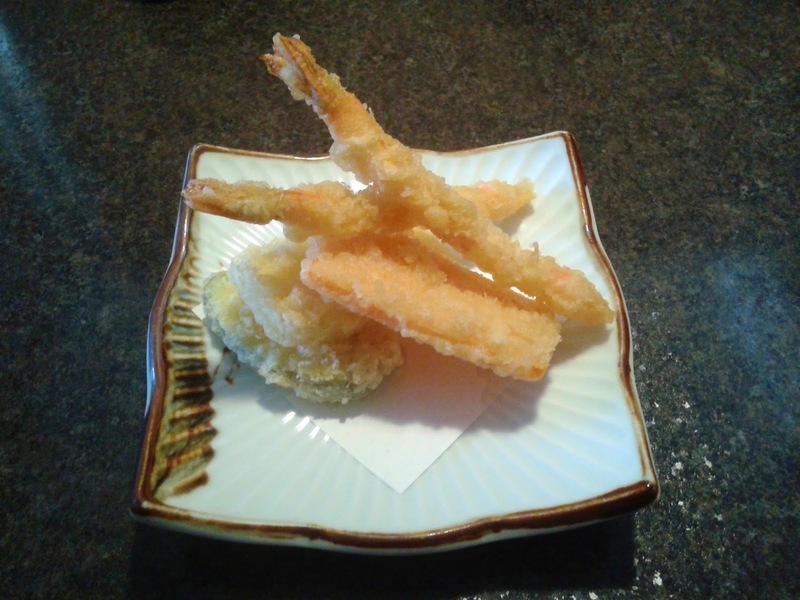 I really wanted to eat healthy, but I couldn't resist getting an Appetizer Tempura. Just one bite into the prawn tempura was enough to convince me to add this restaurants to my list of favourites. The batter was light and crispy with a beautiful golden hue, while the prawns were juicy and rich in flavour. The zucchini tempura was equally delicious. Both the prawn tempura and the zucchini tempura were heavenly and deserved A+'s, but the sweet potato tempura and kabocha tempura felt slightly dry. At first, I wanted to order the Duck Hot Pot on the specials menu, but when I asked about the size of the hotpot, the server suggested that it might be too much food for me since I had also ordered a large nigiri set. Forgetting that I am a glutton, I ordered the Gyutan (sliced beef tongue) and the Deep-Fried Eggplant with Ground Chicken instead. 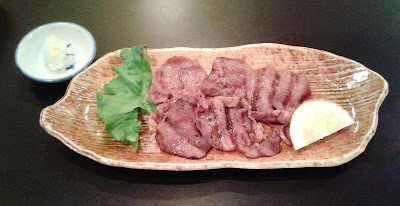 The Gyutan was sliced thinly, so it was not too chewy. It had a nice smoky flavour, but the salt was unevenly applied. As a result, some pieces tasted way too salty, while others tasted a bit bland. The kitchen accidentally prepared a Duck Hot Pot for me as well, and in hindsight, I wished I had ordered that instead since it didn't look especially large, especially for me. Starting at the top, the Tuna Maki came with fresh, rich, and melty tuna. The Salmon Maki didn't really contain enough salmon to make much of an impact, but at least the sushi rice was flavoured nicely. The Red Tuna Nigiri had a mild flavour and a soft, smooth texture. 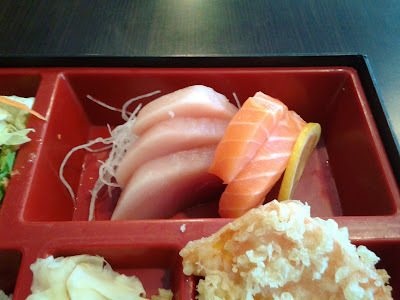 Next, I highly enjoyed the Tuna Nigiri and the Salmon Nigiri, for they were both fresh and had rich flavours. 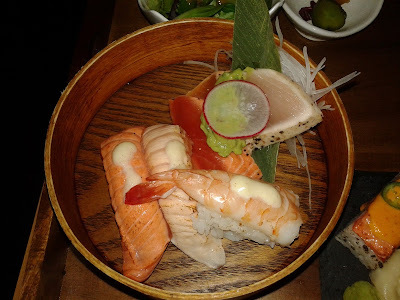 The Madai Nigiri and the Hamachi Nigiri were sliced into generous, thick pieces, but this made them a bit chewy. 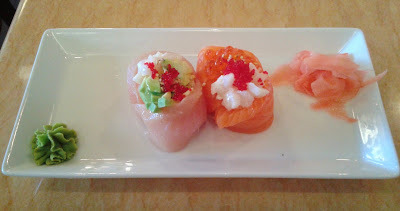 The Hotategai Nigiri had a sweet, sea-like flavour, while the Amaebi was creamy and paired with slightly too much rice. (The fish-to-rice ratio for all the other pieces was spot-on.) The Hokkigai was decent with a sweet flavour. The winner was the Ikura Nigiri, which was very juicy and filled with irresistible, savoury fish oils. The sushi rice was nicely packed and had just the right texture. Staying on the theme of "healthy" food, I had the Deep-Fried Eggplant with Ground Chicken, something which I had never seen at any other restaurant before. The juicy eggplant was surrounded by a light coating of panko batter, and the dipping sauce was a tangy Worcestershire sauce. In my opinion, the Worcestershire sauce didn't work together very well with the flavour of the eggplant. There was also very little chicken, which was overwhelmed by the other ingredients. I was very pleased with the friendly service, and with my visit in general. Not all of the dishes were stellar, but each item was prepared with care. So far, this is the best Japanese restaurant I have been to in North Vancouver. Other than my wallet, every part of me left the restaurant satisfied. Once outside, I got drenched once again before a bus came to whirl me further north into utter darkness. 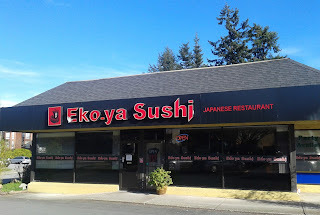 The only thing I managed to spot on this dark, perilous journey back to Vancouver was another sushi restaurant that I could visit on a future sushi adventure. 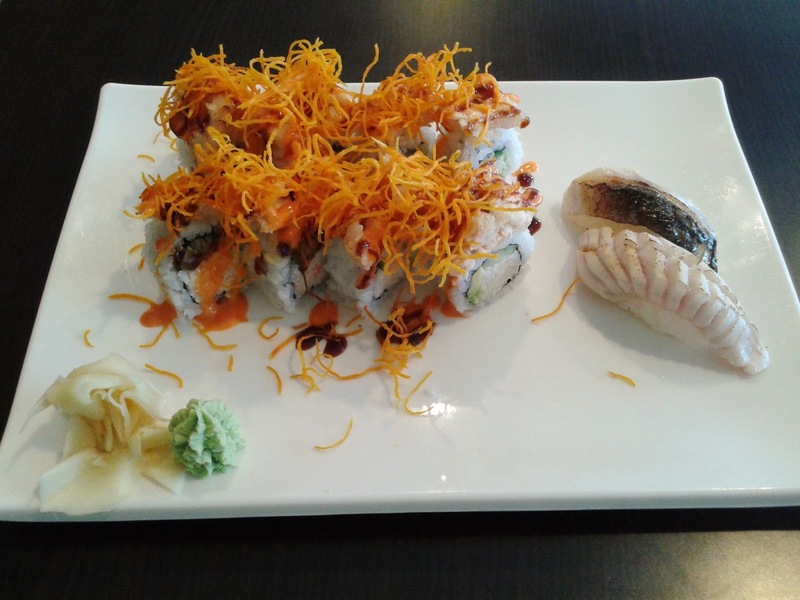 Last Tuesday, I decided to go to all the way to Ladner Sushi because it was reading break, which meant a whole week free of suffering. Both my dad and my sister also happened to be free, so the three of us gleefully participated in the perpetual city-wide traffic jam of New Westminster and then coasted down the truck-filled South Fraser Perimeter Road. Unfortunately, my plan turned into a magnificent fail as I found out that the "Open" sign was not lit up. However, it was a nice day, so we took a walk in the village and wandered into the Delta Museum instead. The museum's numerous historical exhibits turned out to be surprisingly entertaining, and by the time we were out of the museum, lunch hours were already coming to an end. 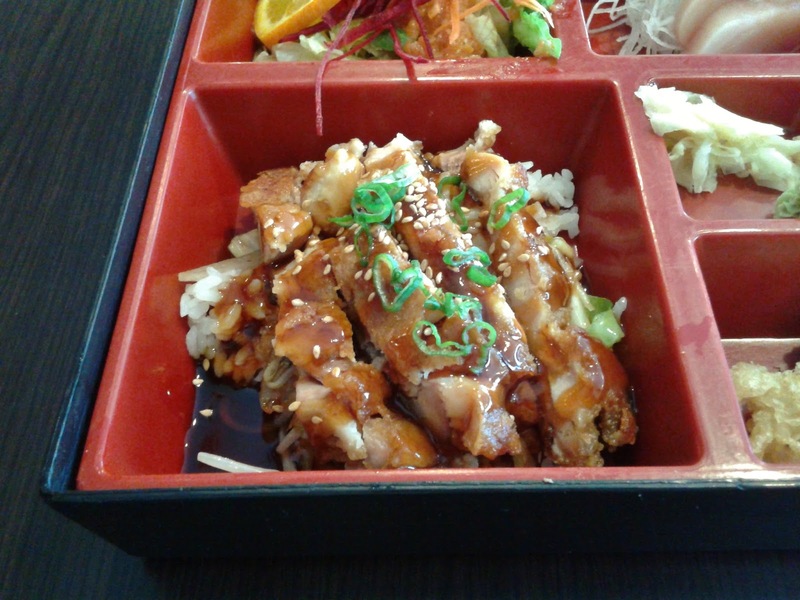 Since we had already spent a fortune on gas, we decided to head over to Tsawwassen and have lunch at the first Japanese restaurant we sighted. 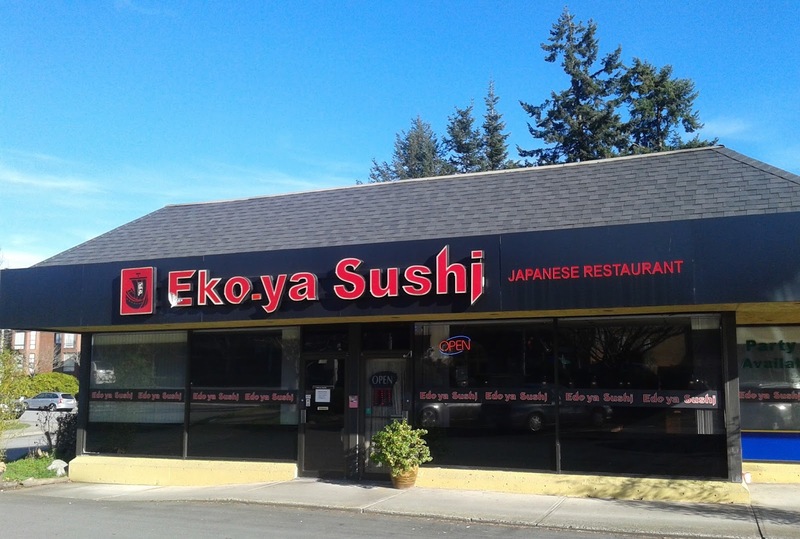 This turned out to be Eko-ya Sushi. We were a little hesitant about dining at the restaurant because of the cracked "E" on the store front signage (okay, that was just me). However, once we entered the restaurant, we found out that the interior was about ten times fancier than the exterior of the restaurant. Furthermore, they were playing classical music on the speakers, so we had no choice but to settle into one of the small Japanese-style dining rooms inside. Things started off nicely with the Tuna Tataki Salad, which was beautifully presented with a carrot flower on top. The tuna had a soft center, a pleasant smoky flavour, and a nice hardening around the edges. 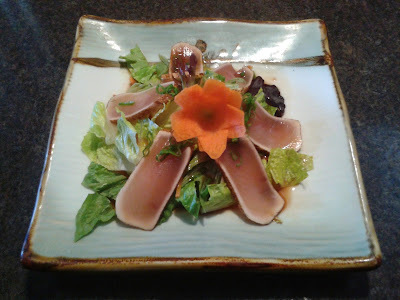 The salad was mainly lettuce-based, and the light ponzu sauce did not overwhelm the flavour of the tuna (though it was a bit too tangy and savoury for the salad itself). Next, we had the Chicken Teriyaki Lunch Box, which came with a small Miso Soup garnished with some green onion. Despite its small size, we still managed to share it between the three of us. 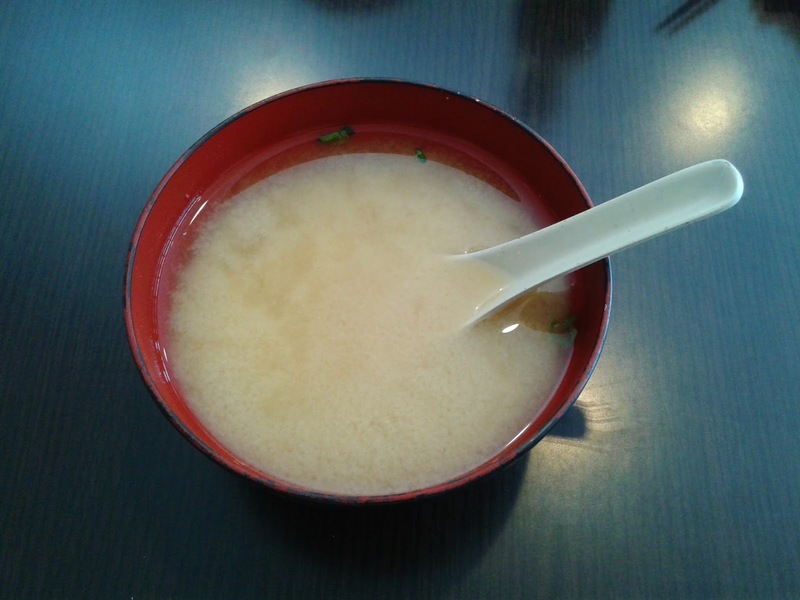 The Miso Soup was not too salty, but I felt that it could have a richer miso flavour. 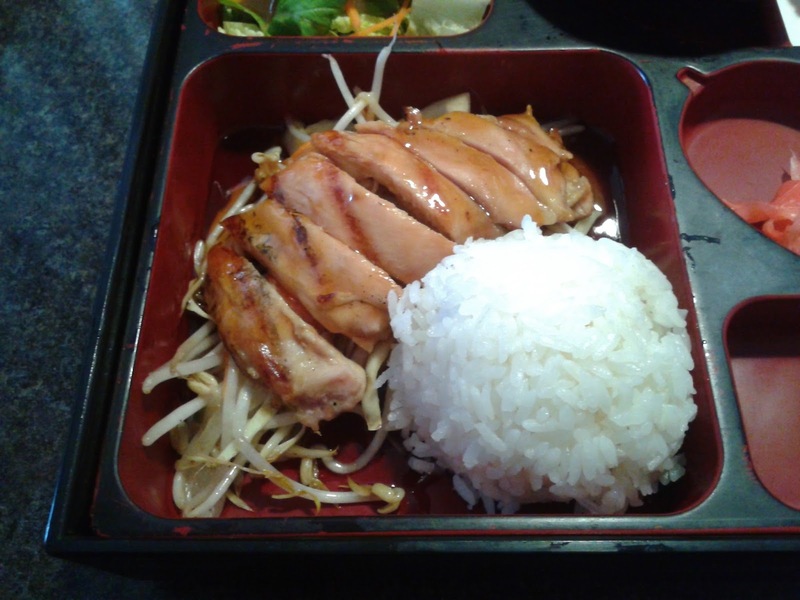 The Chicken Teriyaki Lunch Box was neatly presented, and the portion sizes were in line with what we expected. This Salad was one of the better salads I have had as part of a lunch box. There was plenty of Japanese vinaigrette salad dressing to give the salad a nice tangy flavour. My dad requires one whole piece of prawn tempura every time he goes for sushi with me (especially when the tempura is good), so in order for me to try everything, we had to order a separate Appetizer Tempura. The Appetizer Tempura came with two prawns and one piece each of sweet potato, yam, and zucchini. The prawns were a touch greasy but tasted rich and delicious. The sweet potato and yam were savoury with sufficient sweetness, while the zucchini was juicy. The Chicken Teriyaki was quite standard fare. The chicken was semi-tender with a slight smoky flavour. It was also skinless, so there wasn't any crispiness. Another item that tasted quite standard fare was the California Roll. The mix of avocado and crab meat was as creamy as your standard California Roll. My dad and my sister could not decide whether to order sockeye salmon or Atlantic salmon, since my dad prefers sockeye and my sister prefers Atlantic. After a five-minute conference on this matter, I took the matter into my own hands and ordered both the Sockeye Salmon Sashimi and the Tiger Roll (which has plenty of Atlantic salmon on top). Well, there goes $30. 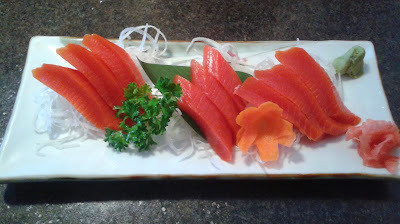 Fortunately, the sockeye salmon was very fresh, and the cuts were generous. The delectable soft and smooth texture of the sockeye salmon was worth the obliteration of my wallet. 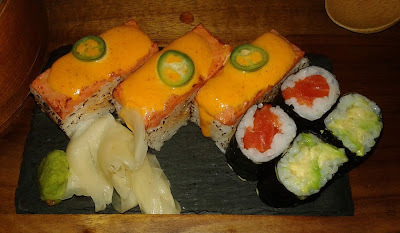 The Tiger Roll consisted of Atlantic salmon, sockeye salmon, avocado, and spicy tuna. I am guessing that it resembles a rare species of tiger with orange and green stripes, hence the name. The roll was neatly constructed, and the smooth textures of the salmon and the avocado blended nicely together. The spicy tuna inside was soft, and its spiciness did not overwhelm the ingredients on top. When I received the bill, I was very surprised to see that they had charged each of us $1.25 for tea. How dare they! While I don't have any complaints about them charging extra for tea, I do think they should have told us about it beforehand because it was completely unexpected. We were all so focused on the food that our tea was barely touched. On the positive side, we were satisfied with the service itself and the quality of the food even after taking into consideration the higher prices. 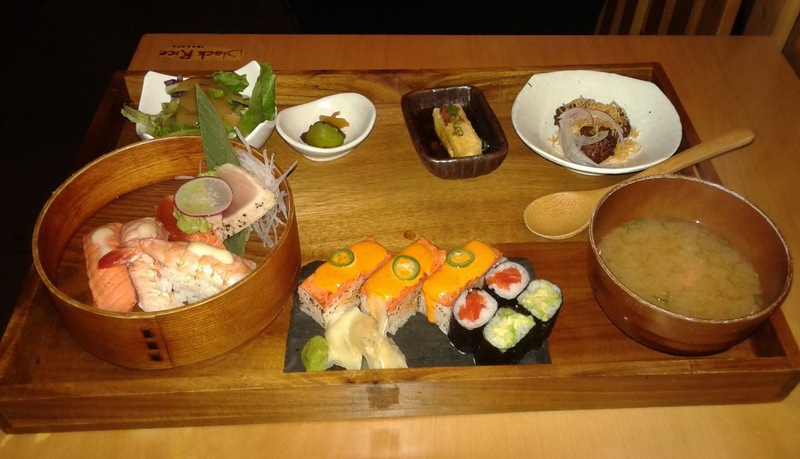 The rain has come back once again, but nothing is a problem when there's sushi involved. I first found out about Black Rice Izakaya last summer in my search for Aburi sushi in Vancouver. However, being the forgetful person I have become (darn you, old age memory loss), I managed to forget about trying this place until now. Expecting high prices, fancy Aburi, and other creative items, I prepared myself to enjoy an expensive lunch with perhaps more dishes than I should order. 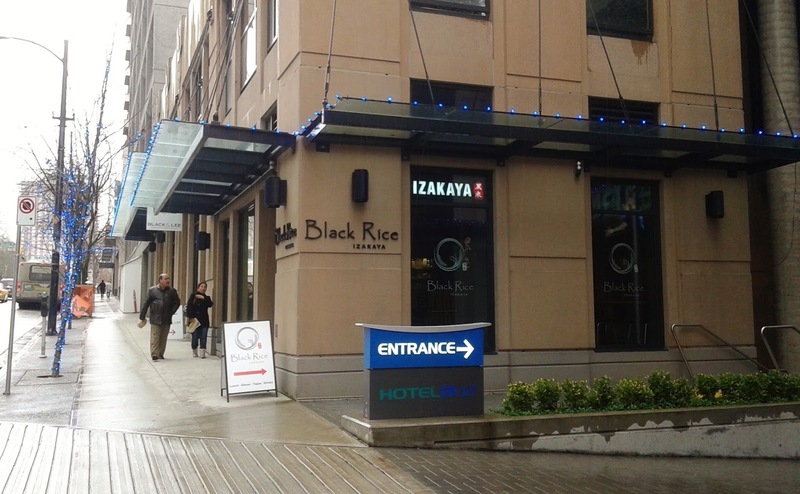 Black Rice Izakaya is Korean-operated and has a pleasing, semi-fancy appearance inside. I looked inside the menu and was ecstatic to find that there was a teishoku lunch combo that contained Aburi sushi and many other small dishes! I could now spend just $15.95 on what I had planned to spend $40 on, which meant that I could save the money to buy my sister heaps of potato chips. The only issue was that the lunch menu only contained four sushi rolls. Since the fanciest roll contained cream cheese (of which I am not a fan), I went for the second fanciest roll, which was the Volcano Dynamite Roll. 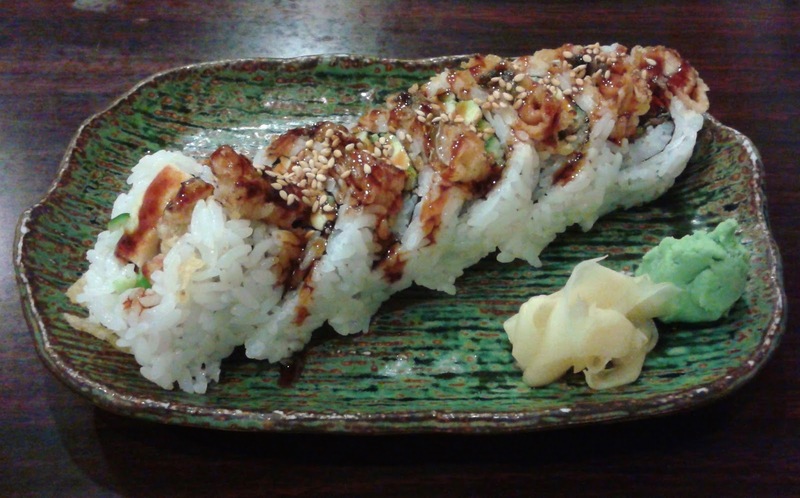 The Volcano Dynamite Roll consisted of crab meat, prawn tempura, cucumber, avocado, spicy tuna, and brown rice. I enjoyed the savoury prawn tempura and could feel the snap of the juicy prawn. 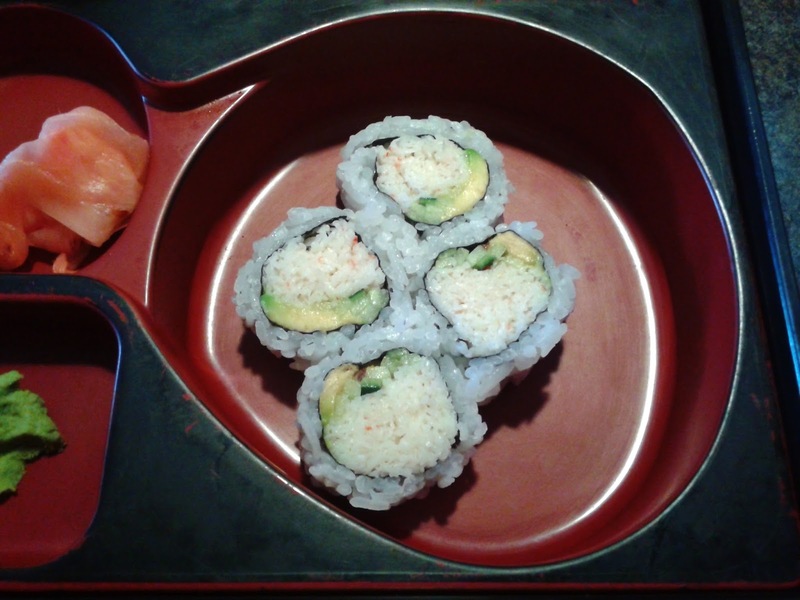 The crab meat inside was soft and mildly creamy, while the avocado added some sweetness to the roll. The spicy tuna wasn't very spicy, but it had a nice zing, and the sprinkles on top contributed some crunch to the roll. Next, the Teishoku A arrived on a marvelous wooden table tray. Note that the teishoku sets are available during lunch hours on weekdays only. The Chef's Selection Aburi Sushi and Sashimi in the teishoku set came with three pieces of Aburi nigiri and three pieces of Aburi sashimi. The nigiri exhibited solid rice formation. The sockeye salmon was slightly smoky, but it didn't have much of a salmon flavour. The Atlantic salmon was better in this regard and had a nice smooth texture. The mayonnaise on top of the Aburi Ebi Nigiri enhanced the flavour of the prawn. I thought the pairing of guacamole with sashimi was a clever idea. After all, we often mix the fish with avocado and salt (from soy sauce) when we eat sushi rolls. The sockeye salmon once again lacked a distinctive salmon flavour, but the Aburi Salmon Sashimi was buttery, soft, and smooth. It was enhanced further by the creamy guacamole. The Aburi Tuna Sashimi was also fresh, though it tasted more like tataki, with a nice hardening around the edges. The Aburi Spicy Salmon Hako was indeed quite spicy due to the use of spicy mayonnaise rather than regular mayonnaise. The rice was packed a bit tightly, but the salmon on top was savoury. 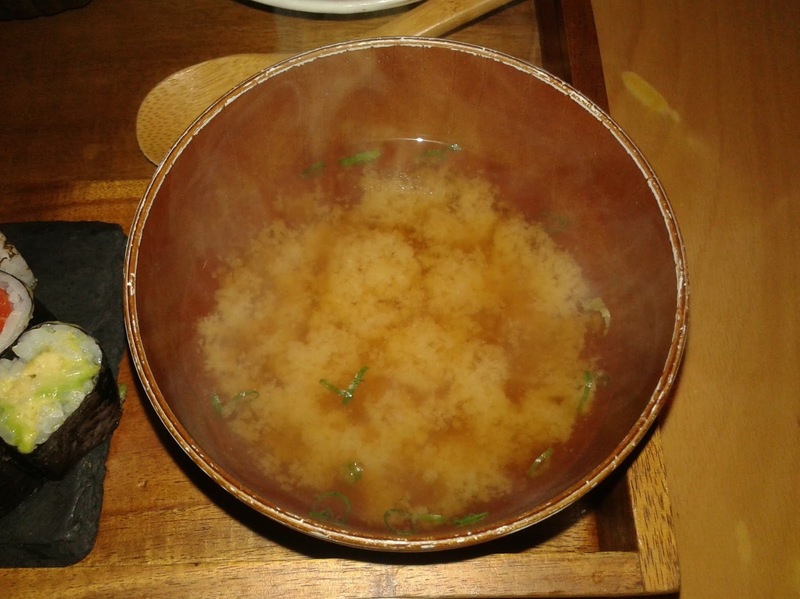 After finishing the salmon hako, I had to drink all of my tea, half of my miso soup, and some gomaae sauce in order to clear the spice from my taste buds. 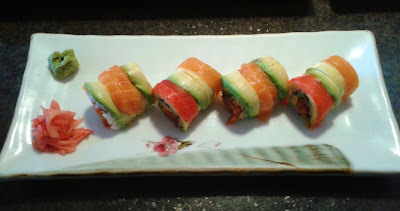 Moving on, the Sockeye Salmon Roll contained copious amounts of sockeye salmon, which was predictably weak in flavour. The Avocado Roll, on the other hand, featured fresh, creamy avocado, which was enhanced by the savoury house-made sushi shoyu (soy sauce). Here is the piping hot Miso Soup that I used to wash the spice out of my mouth. 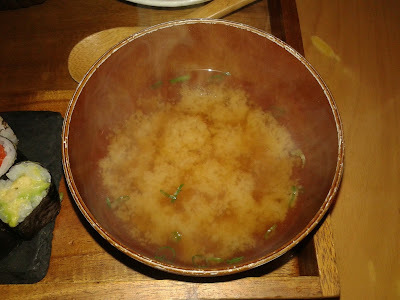 It was more effective than the tea, and at the end, I could tell that it had a rich miso flavour and was not too salty. It came with only some green onion, but it had a good consistency. 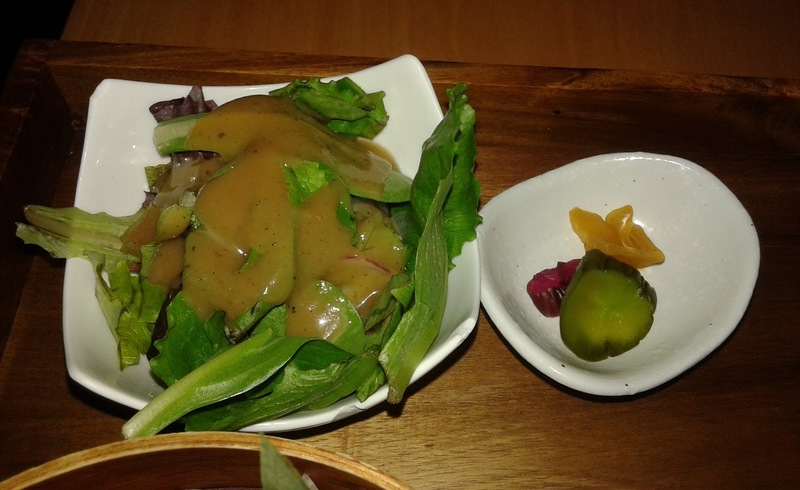 The Green Salad came with mixed greens, which were dressed with a combination of tangy Japanese salad dressing and gomaae sesame sauce. I liked how the sauce was evenly spread throughout the salad, and the gomaae sauce provided a unique sweet flavour to the salad. The gomaae sauce also helped me clear some of the spiciness from earlier. The oshinko (pickled goods) consisted of one piece each of takuan (daikon), kyurizuke (cucumber), and shibazuke (description too long to put here). 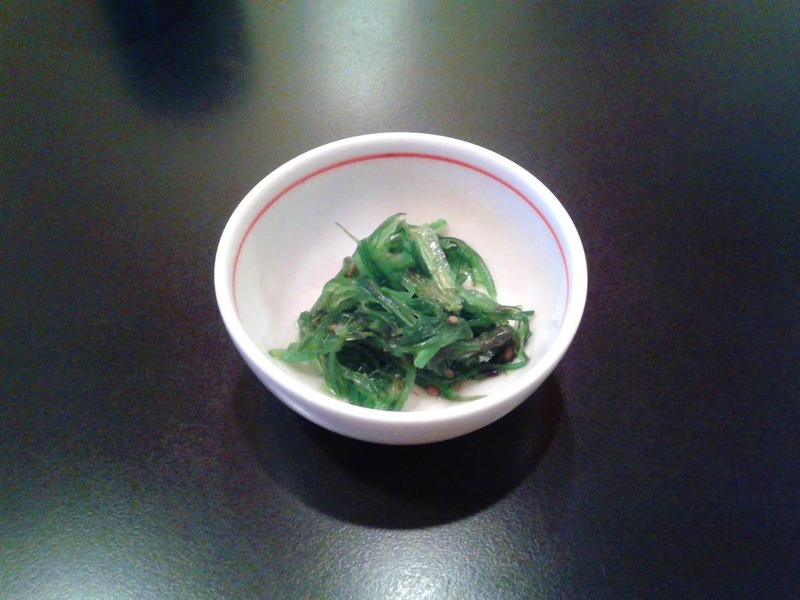 Each piece had a nice crunch, but the oshinko was a bit dry and tasted average. 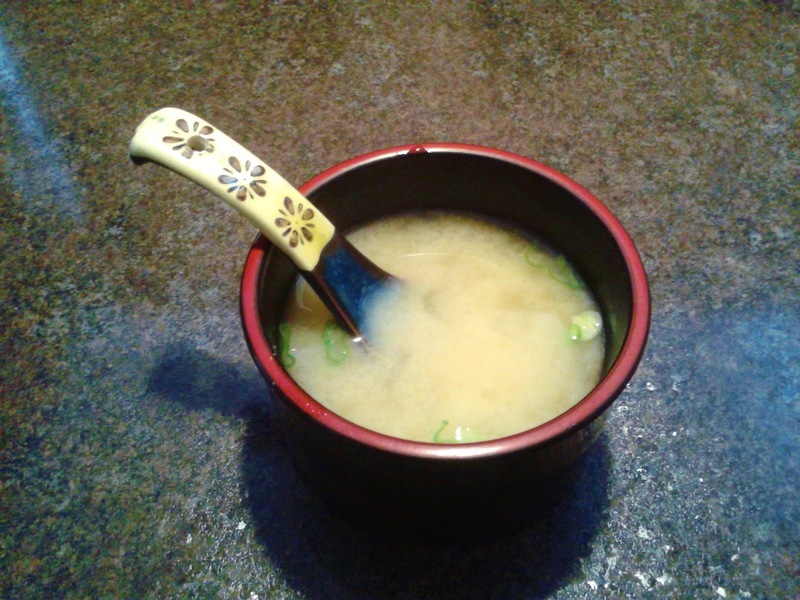 The Agedashi Tofu had a nice crispy exterior and some smooth, soft tofu inside. I liked how it was enhanced by small bits of dried porked, those these were a bit chewy. My least favourite item was the Beef Karaage, which tasted like lightly fried meatballs. It was hard around the edges and weak in flavour. The service here was just average. They never noticed that my tea ran out, but they seemed very intent on taking my menu away while I was trying to discreetly copy the item descriptions down into my notebook. I tried to tuck the menu away on the far side of my table, but it slid through the crack between the table and the staircase and ended up crashing to the floor. The troubles I go through as a food blogger... Despite the average service, the food was above average and relatively affordable with the help of the teishoku sets. My bill only came to about $25, making this one of my cheaper sushi adventures! After running some errands for my sister at Aberdeen Centre, I found myself stuck at the mall with no target restaurant for my sushi adventure. I had forgotten to do my research! I pulled out my phone and tried to do a search on Zomato for the nearest sushi restaurants, but after waiting a minute for the search results to load, my Wi-Fi disconnected. Thanks, Shaw Open. After a few more unsuccessful tries, I decided to pull out my hair instead. However, there was a silver lining. Just as I was about to exit the mall, I tried the search one more time and was able to find Torarenbo. 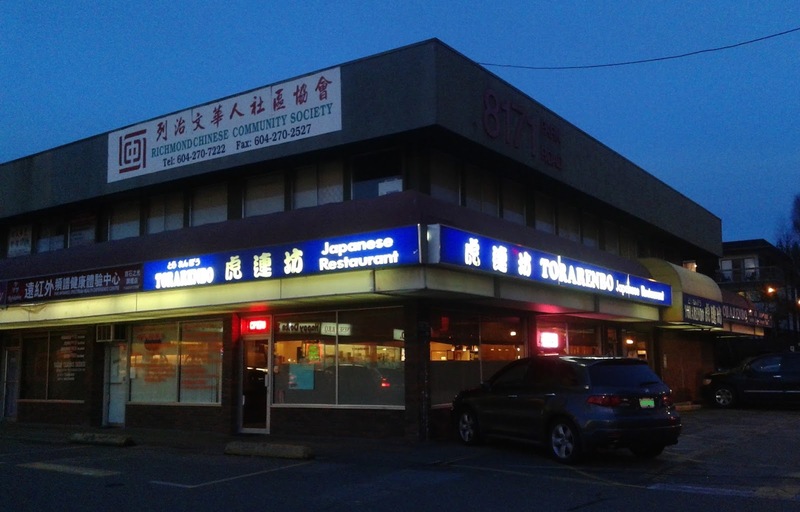 Like many other Japanese restaurants in Richmond, Torarenbo operates at the higher end of the price scale, but it is comfortable, cozy, and adequately spacious inside. This pleasant atmosphere was paired with some melancholy Japanese pop music. I am not sure what's up with the sadness in Japanese music. First, I had to endure the tragic koto music at Kuma, and now this. Directing my attention elsewhere, I opened the menu and found my beloved fancy nigiri, but surprisingly, there was no teriyaki on the menu despite this being a Chinese-operated restaurant. 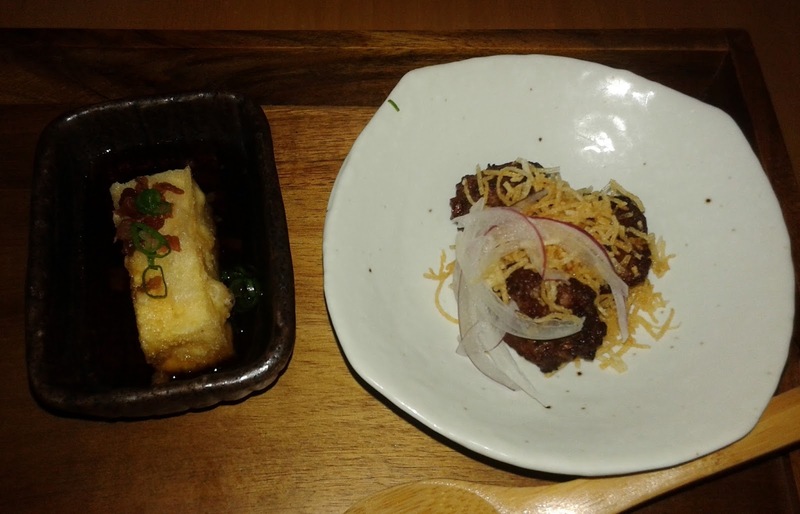 There were, however, some robata items. Not wanting the bill to explode, I went with the Unagi Tempura Roll, which came with unagi tempura, tamago, avocado, and cucumber. 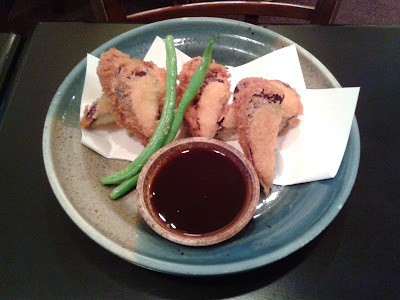 The unagi tempura was sweet and lightly crispy, and the thin layer of avocado, which surrounded most of the filling, enhanced the sweetness of the roll. They were quite conservative with the unagi sauce, so it tasted slightly underwhelming without copious amounts of soy sauce. 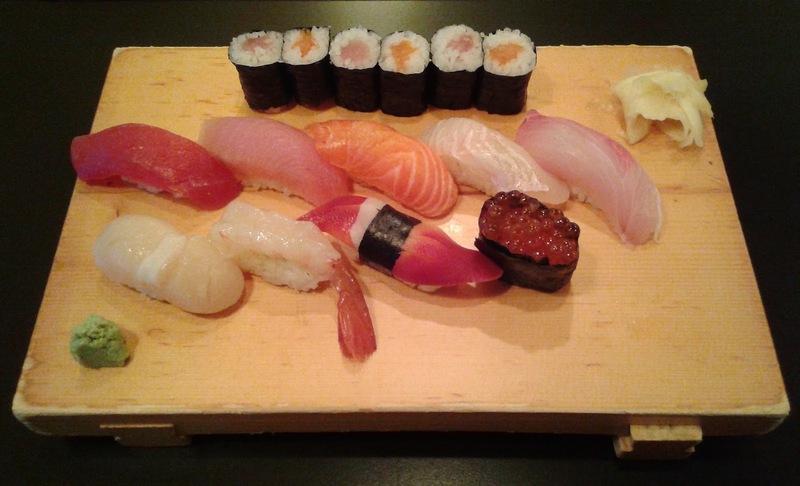 To get a sense of the prices here, this plate of nigiri cost me more than $12. I am not kidding. 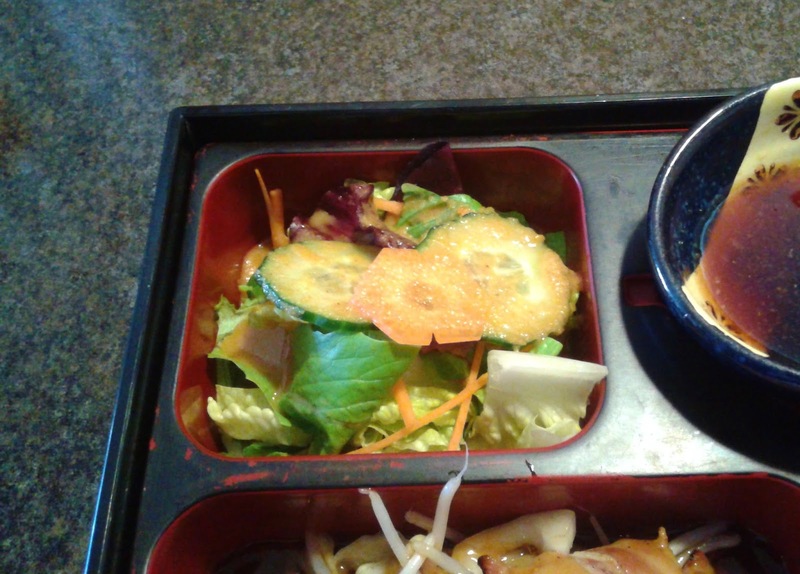 The unagi was not particularly soft and did not have much of a smoky flavour. Upon the waitress' recommendation, I decided to try the Tai Belly Nigiri (a daily special), and it fared much better. 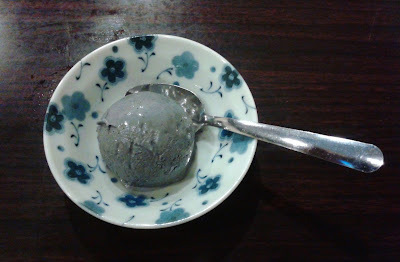 It had a soft, somewhat flaky texture and exhibited a delectable, well-rounded sweetness. The Toro Nigiri was also decent and featured a very smooth, melty texture. The Saba Nigiri had a well-balanced flavour and a soft texture. The sockeye salmon was not the most flavourful I have had, but at least it was soft. 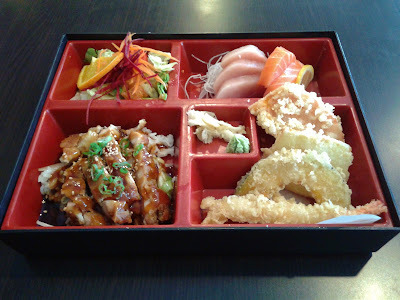 Each piece demonstrated a good fish-to-rice ratio and came with well-formed sushi rice. The Ebi Mayo came with 6 prawns, which were not especially large. The batter was slightly overused, and the prawns were overdone, making them chewy. However, the bubbly mayonnaise (there were very tiny pearls in it) went well with the savoury flavour of the prawns. 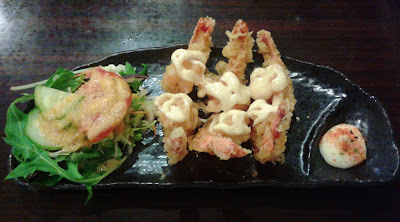 The Ebi Mayo also comes with a green salad, which was ironically better than the Ebi Mayo itself. The Seafood Motoyaki was the highlight of the evening. It arrived very hot and came with a good amount of seafood, which included baby shrimps, oyster, mushrooms, and what tasted like lots of salmon. 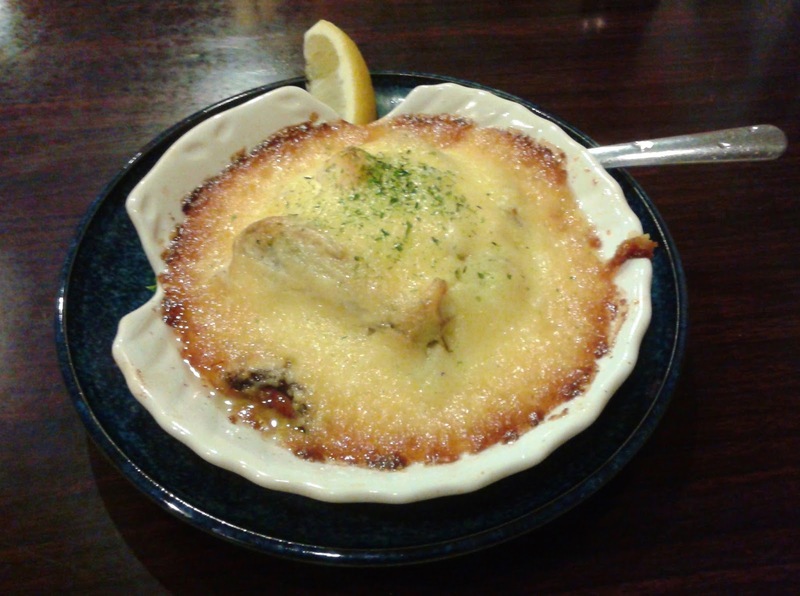 The soft custard was graced with crispy edges and some garlic sprinkles on top to enhance flavour. It was slightly heavy on the oil, but all the flavours worked together very nicely. After finishing all the food above, I was presented with a Black Sesame Ice Cream on the house! It was sweet and had a nice ground sesame texture. 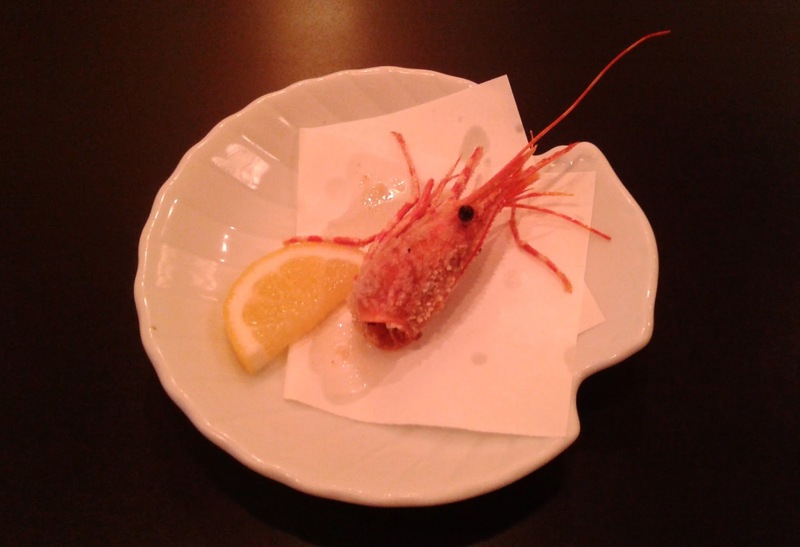 Furthermore, it was served at the right temperature (ahem, Yokohama). The service was some of the friendliest I have ever received at any Chinese-operated restaurant. Although the prices were high, the quality of food was decent, and higher prices are the norm for the area. I wouldn't say that the food was amazing, but if you must have sushi in Richmond, Torarenbo is one of the better places to dine at.